Stoick the Vast was the chief of the Viking village on the Isle of Berk. He was the ideal Viking chief, displaying strength, bravery and an extremely stubborn nature. 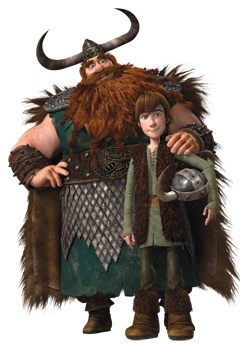 Stoick was easily identified by his large build, his immense red beard and a horned helmet made from his wife’s armor. Signifying his position as leader of his clan, he also wore a fur cape around his shoulders. Given his numerous abilities, Stoick was well-regarded as a dragon slayer, as he had successfully led his clan into battle against the dragons that raided his village for years. His ultimate goal was to one day find the famed Dragon's Nest to finish off the population that had been plaguing his people. When it was revealed that Hiccup was more adept at training dragons than killing them, Stoick was incredibly disappointed in his only son. However, with some difficulty, Hiccup was able to convince his father that dragons were not vicious beasts and could be tamed and trained. It took a while, but after the fight with the Red Death and witnessing Toothless’ and Hiccup’s devotion to each other, Stoick was finally able to understand. 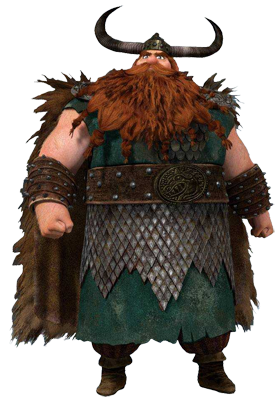 Five years after the truce between the Vikings of Berk and dragons, Stoick was reunited with his long-lost wife, Valka, whom he once believed to be dead. The two rekindled their romance, but his family’s reunion was cut short when Drago’s alpha Bewilderbeast gained control of Toothless and the other dragons. Under his command, Toothless almost killed Hiccup with a plasma blast, but Stoick pushed his son out of the way, sacrificing his life. While Hiccup, Gobber, Valka, Toothless and the other Vikings of Berk were devastated at the loss of their beloved chief, he left behind a strong and powerful legacy. Hiccup, who has inherited his father’s role as chief of the village, knows that he has big shoes to fill, but he is positive that his father has provided him with the proper wisdom to lead his people with confidence. We here at the School of Dragons mourn the loss of our former chief, but we hope that by training the next generation of courageous and daring Vikings, we will be carrying on his legacy.